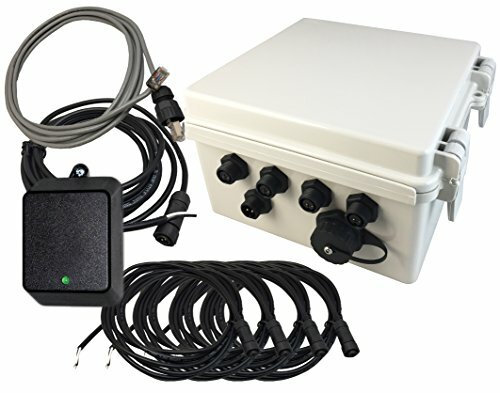 The 2 Gen. Netbell-4 bell controller is installed within a NEMA (IP66) rated box that can be used in environment where dust and non-direct water are issues. The new Netbell-4 is a compact, self-contained design device that was created with ease-of-use in mind, supplied with the hardware and software you will need to control the bell timer devices. There are 4 dry contact relay outputs with CP connector that provides quick connect/disconnect capability simplifying installation that allow you to control up to 4 bells/buzzer and other timed signal equipment from 12V-48V at 10A. Netbell-4K web-based bell controller is built on a TCP/IP platform with a built-in web server and special software designed for scheduling a bell system, all software and mounting hardware required for installation and operation are included. With Netbell-4, you can access, control and schedule bells individually over a network, no additional software or designated computer required. The built-in web interface provides quick access to setup and manage your bells. It’s an ideal solution for schools, factories to build a fully automated web-based timed alert system for signaling class changes, shift rotations, breaks and any other timed signal applications. It's ready to go out of the box, and you need only connect the unit to the power outlet and network with the provided cables; it can be connected anywhere on the network, and does not require a direct connection to a PC. Scheduling and setup is accessed through any standard web browser. Use our “Discover” program to find its IP address on your network, you are good to go.